• Baseball bat sports noise makers are the perfect combination of fun and volume. This inexpensive noise generator is perfect to take to all your favorite baseball games to support your team! • Imprint your baseball team's colors and logo, along with any other artwork you have in mind. These school spirit inflatables are great for businesses looking for an effective marketing tool. Free artwork design service! 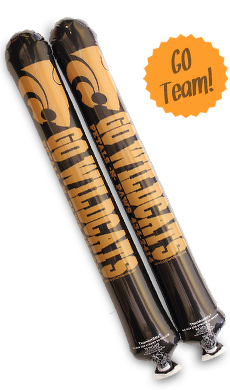 • Designed for 24" x 4.25" baseball bat noisemakers and made with our premium material. Imprint Area: 2.25" x 13"